Women use makeup brushes on a daily basis – dipping them in makeup and using them to their faces. Your makeup brushes gather facial oils, dirt, bacteria and other buildup which can cause problems and irritate skin. They are here to make us beautiful but they are sometimes counterproductive. This is why you should clean your makeup brushes on a regular basis. How often do you need to clean your personal makeup brushes? Makeup brushes are a product that should be cleaned and care for thoroughly. You are using them every day, and they are fertile ground for all types of bacteria. You should clean your makeup brushes every week at least once (but try to clean them more often). In this way you will help avoid the possibility of skin aggravation and breakouts and you will also prolong the life of your makeup brushes. Margi Tobey, Mehron makeup professional, says that she pours some alcohol in a bowl and swooshes makeup brushes around for a deep cleaning. Also, you can use alcohol to wipe down handles of brushes. After that you should use a solid brush shampoo. She suggested Bare Mineral Well-Cared for Brush Conditioning Shampoo . A rich foaming cleanser with nourishing ingredients removes all traces of oil, dirt and makeup. Also, it is very important to use tepid water because hot water can harm the bristles. You shouldn’t let the water hit above the metal part or shaft because the glue can loosen and makeup brush can go to pieces. 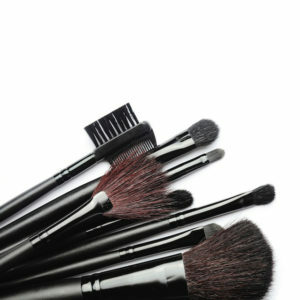 Wet your makeup brush in tepid water, wet the soap, and swish the brush back and forth in a container and wash it out. Tobey says that she likes to wash out the makeup brush while swirling in the palm of her hand until clean. Always make sure to completely remove all water and lay the brush on a napkin hanging over the edge of a counter or table so the air flows and dries it quicker. You mustn’t stand makeup brushes up to dry because the water may enter the handle and the brush will go to pieces. You should wash your makeup brushes at night because it will take some time to dry. Ramy Gafni, celebrity makeup professional and eyebrow expert recommends to spray some alcohol on the paper towels or on the bristles and use the alcohol dipped towel to wipe down the bristles or run the makeup brushes backward and forward on the towel. Alcohol is also very effective because it eliminates bacteria and germs. You can use baby shampoo instead of traditional brush cleaners. It is very important to wash the shampoo out completely and lay the makeup brushes straight on paper towels and let them dry. Gafni explained that you shouldn’t keep the makeup brushes standing upright as they dry because water may run down and loosen the glue which holds the brush in place, causing the handles to fall off. We make a huge mistake when we immerse brushes in water for too long. Wafaa Debs, a beauty expert in New York, says that this is not a good idea because you let the water to enter the glue which holds the hairs and loosen it resulting in weakening of the hairs of the makeup brush.